Watch out for awesome summer deals! One of the things we can be truly proud of as Filipinos living in the Philippines is that we’re blessed with bold and picture-perfect sceneries, natural and man-made, all year ‘round. But with the tropical heat in its fiercest this summertime, don’t you just wish you can see these views while STILL being comfortable? These resorts will take care of that. We can’t talk about summer without thinking of the tropical paradise of Palawan. Located north of the province is the town of Coron, where you’ll find the rustic yet chic boutique resort The Funny Lion. 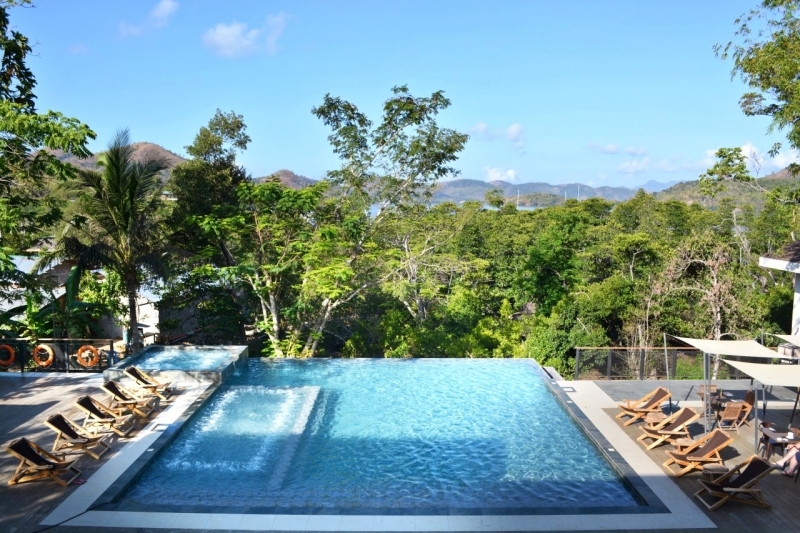 Just 30 minutes from Busuanga Airport, the resort offers a dynamic scenery of far-off islands, waters and mangroves. The rooms are minimally decorated but sufficient for a hassle-free and productive stay. Among the amenities you can find are LED television, coffee and tea making facilities, hot and cold shower and individually controlled air-conditioning unit. Outside your accommodation, you’ll find satisfaction at their small yet stunning infinity pool and their two dining venues, Hunt Restaurant and Pride Rock Deck. After a long day in the sun, take a breather and head over to the resort’s Pride Rock for the Happy Hour at 5pm, where you can sip The Funny Lion’s feisty signature drinks. Visiting on a weekend? You’re in time to taste Hunt Restaurant’s finely grilled dishes at the Saturday Grill Buffet. You can get them from 6-9pm for only ₱650! Get this rate and more perks by booking directly in the resort’s website. 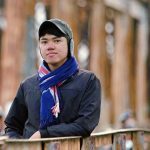 Back in Palawan’s capital city of Puerto Princesa, Astoria Palawan attracts tourists from all over the world with its ability to mix nature and avant-garde facilities in one place. The property sits in a five-hectare mango orchard which is a total plus if you love eating tropical fruits in between your activities in the hotel. The hotel also takes pride in having the first and only waterpark in the province which features several rides and slides, a wave pool and splash pods! If a chill water time is ideal for you, Astoria Palawan also has a 39-metre infinity pool facing, almost touching, the Sulu Sea. 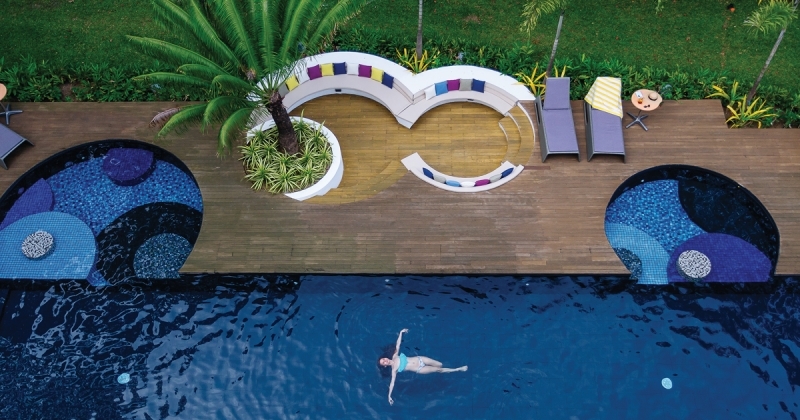 Sunken loungers adorn one of its sides, and the whole facility is literally lit up at night with colourful lights. A few other things to look forward to are the Mangrove Conference and Convention Center, The Canopy and the Halo Dome. Learn more about Astoria Palawan on TripZillaSTAYS. Aside from experiencing world-class facilities with Astoria Palawan, get ready to pack your beach bags for a Sandbar Adventure! Grab this summer offer which already includes a boat ride, cold towels, beach towels, a bottled water, 2 bibingkinitan and fresh buko. Only 20-minutes boat ride away and you'll feel the powdery sands on your feet. Book now and add in a lunch package and rent a snorkel gear for a fun day out! Art, adventure and convenience — these are perhaps the first three things you’ll think of upon entering Canvas Boutique Hotel located in Palawan’s capital city. It’s only a mere walking distance from Puerto Princesa International Airport, and even then, you can still get an airport transfer for free! All levels of the hotel sport a particular theme based on the wonders of the province, from its mythology to its world-class natural treasures, and you can especially see them through the Canvas walls. A few of the themes shown are the Sky and Mountain on the third floor which highlights the Palawan Hornbill, volcanoes and local deities, the Sea Level featuring the vibrant marine life of Palawan and in four of the guestrooms, an image of the famous Tubbataha Reefs National Park. The hotel’s tagline “Your Palawan adventure starts here” also captures the another important offer of the hotel — memorable adventures that will last a lifetime. There’s an amazing summer swimming opportunity in the 20-metre pool. Instead of the typical beach backdrop, you have the refreshing ambience provided by the surrounding garden. Your stay in the hotel won’t be complete without dining at the Painted Table restaurant, which features a girl from Palawan’s Batak Tribe along with local flora and fauna for a gastronomic AND visual dining experience. Learn more about Canvas Boutique Hotel on TripZillaSTAYS. Canvas Boutique Hotel’s inspiriting ambience makes for a unique Palawan summer escapade. That’s why the hotel is offering you extra special rates for booking directly on their website or Facebook page. Get up to 15% off on best available rates plus free breakfast and airport transfers! If you’ve selected Cebu as your 2018 summer destination, you’ll find that everything you need for a relaxing time can be found at Shangri-La’s Mactan Resort and Spa. The five-star resort is only a 20-minute drive from Mactan Cebu International Airport and is everything an upscale hotel experience stands for. It has a total of six dining destinations, a couple of swimming pools, a world-class spa and a beach cove from where you can embark on some of the best water adventures in Cebu. While obviously on the high-end category, all 530 of the resort’s rooms and suites haven’t forgotten to showcase native offerings through banana leaf and rattan touches. There’s also a business centre equipped with all the latest technology for small or big company events, a multi-storey indoor playground for kids called ADventure Zone which has daily activities, the entertainment hub E-Zone, mini golf course, and a six-hectare marine sanctuary with more than a hundred species of marine life. 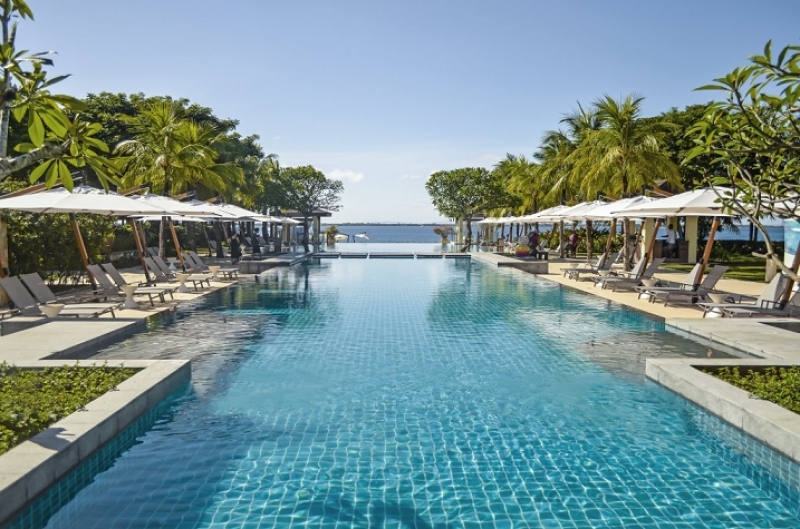 Learn more about Shangri-La's Mactan Resort and Spa on TripZillaSTAYS. Make your summer 2018 stay at Shangri-La’s Mactan Resort and Spa truly one to remember by availing their exclusive offers! Start with the Family Fun Package. On top of accommodation, you’ll also get a daily breakfast buffet for two with complimentary meals for up to two children aged six years old. They’ll also get unlimited access to Adventure Zone and use of snorkelling and kayaking equipment, regular resort activities, round-trip shuttle transfers and savings on other services. Want to be as close to the water as possible? Try the Seaside Indulgence, where you get 20% discount on the best available rates on the Ocean Club rooms and suites, buffet breakfast at the Club Lounge, Acqua or Tides and complimentary kayak and snorkelling activities, and access to the Water Pavilion at CHI, The Spa, among others! People who prefer a jam-packed summer can go ahead and book a room at Crimson Resort and Spa Mactan. This elegant, award-winning abode won’t let you leave Cebu without having a camera full of fun-filled memories that go beyond relaxing on a lush bed. Framed by mesmerising emerald waters and palm trees, the resort caters to couples, families and other guests who have long dreamt of a unique way to spend the ultimate summer getaway. You can choose from nearly 300 guestrooms and private villas decorated with soothing colours and opulent Cebuano touches. The private beach cove is the fitting venue for a wedding ceremony, intimate dinner during a weekly open-pit grill or energising beachside activities. Relieve some stress at Aum Spa, which was awarded the Philippines’ Best Resort Spa by the World Luxury Spa Awards. You can also destress at the infinity pool, which also hosts water aerobics sessions and a foam party! Finally, get up close with the stunning marine life at the resort’s own marine reserve. 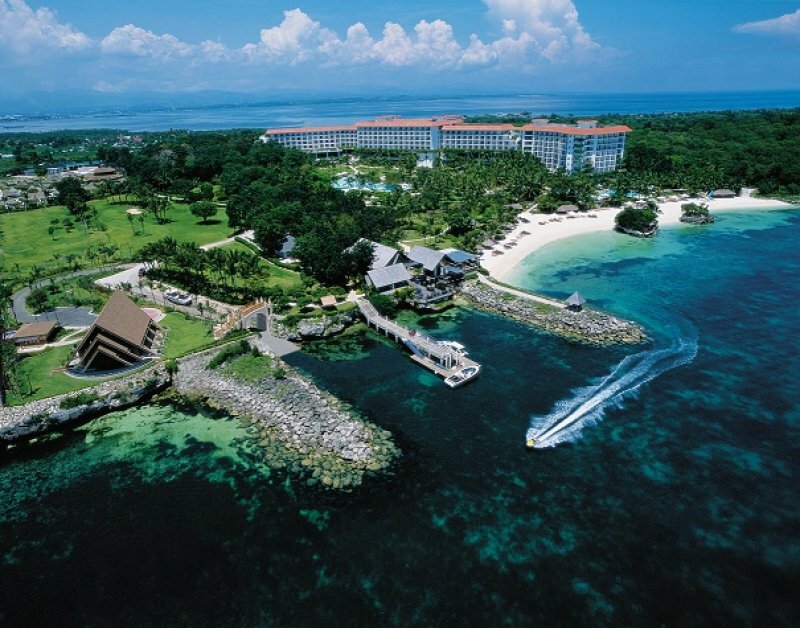 Learn more about Crimson Resort and Spa Mactan on TripZillaSTAYS. These amazing amenities and picture-perfect memories at Crimson Resort and Spa Mactan are all yours to experience through the resort’s exclusive offerings. Say hello to summer with Summer Daze, which lets you pick your room of choice, pig out on a scrumptious buffet breakfast, get a ₱500 room rebate per night for a few of the resort’s services and amenities, belt out at the Karaoke Room, and more! Villa guests also get to enjoy additional benefits like getting personalised service courtesy of a villa host and special welcome treats! 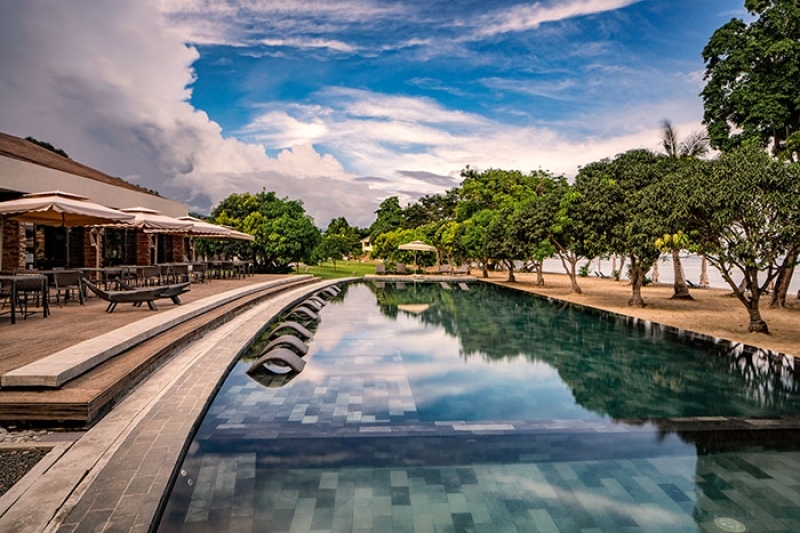 You can also enjoy some of these offerings with Stay Local by using the promo code LOCAL upon booking, where you can get up to 40% discounts on Aum Spa services and experience exciting non-motorised water activities, a poolside foot massage and other surprises. Red Coconut Beach Hotel is as unique as the first two words of its name. One of the first resorts on Boracay Island, the hotel has truly made the effort of displaying as much raw tropical hints as possible in order to truly give guests from all over the world the experience they flew in for. The heavy use of browns and greens throughout the property are only the beginning. Watch out for the mouth-watering crepes, mango shakes, pizza, seafood and hamburgers known to be the best in the area. The rooms are abundant of natural light and feature furniture pieces like the ones you would see in a typical Filipino home but with a little more kick. You’ll find jacuzzis and bathtubs in the hotel suites as well as verandas and balconies looking out on the pool and the beach in most rooms. If you’re a party-lover, then look no further than the resident bar of the hotel, Coco Bar, famous throughout the island. In the afternoon, it’s also one of the best spots to simply chill. They also have a beachside restaurant and wait for it… a live streaming of Boracay beach 24/7! Learn more about Red Coconut Beach Hotel on TripZillaSTAYS. Experience added perks when you book early with Red Coconut Beach Hotel, including a 38% saving for booking at least 14 days before your intended arrival on low season. You can also get a 30% discount on published room rates during high season. If I were you, I’d plan my visit right away! 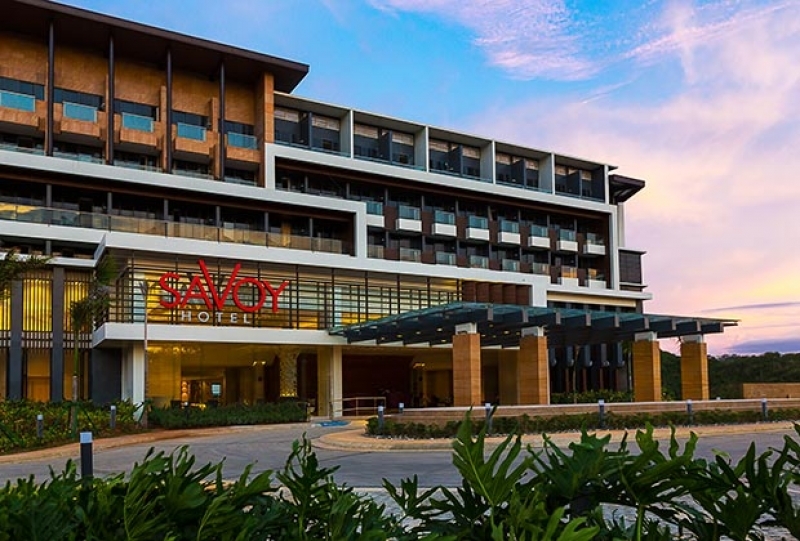 From a pioneer, we introduce you to the new Savoy Hotel Boracay, a four-star hotel just about to celebrate its first year on the island this April 2018. It’s located on another side of Boracay, particularly in the integrated tourism estate of Boracay Newcoast, and dubbed as the “first and only master-planned leisure oriented community in Boracay”. Although a newcomer, the hotel has already started to make a buzz among tourists because of its impressive facilities and generally distinct atmosphere compared to the rest of the accommodations in Boracay. A couple of favourite destinations in the property are the Savoy Cafe which offers all-day dining options and the Vienne Lobby Lounge where guests can see the beautiful landscape of the hotel. The hotel also has a paved sunbathing lounge that’s perfect for an afternoon of pure relaxing in the sun, a concert pool and arena, a pool bar, an outdoor stage that features live entertainment, meeting rooms, banquet facility and a fitness centre. Each of the 559 rooms of the hotel has its own balcony, LED TV, coffee and tea-making facilities and more. Ready to plan your stay at Savoy Hotel Boracay? Be sure to avail of their special rates good for your entire summer trip. With Intimate Escapade, you can have a private dinner with your special someone, at least a two-night accommodation in a Premier Deluxe Room, 15% discount at F&B outlets, in-room massage, and complimentary round-trip shuttle service to D’Mall. If you’re a Philippine local resident, balikbayan or foreign resident with ACR or proof of residency, you can also get 40% off on booking rates and other stay perks by availing of the Local Residents Promo! Located south of Alona Beach in Panglao Island, Amorita Resort is loved for providing gorgeous views of Bohol Sea all day long. The entire seaside resort oozes with distinct elegance with everything else Bohol has to offer in terms of nature and hospitality, which make it an easy go-to place for people who want to experience the province in one place. Right from the rooms and suites, you’ll get a sense of what ‘nature meets luxury’ means through the careful use of native and high-end facilities. Those who have extra money to spare can book the Ocean or Garden Villa for the total staycation pampering. Both rooms feature a view to die for, along with flat-screen cable television, mini-bar, hot and cold rainfall shower, twice-daily housekeeping services and bath amenities with organic soap and shampoo. Stepping outside the room, you’ll want to embark on your adventure with the rich marine life of Bohol through diving and snorkelling, go on a cycling trip around the property using complimentary bicycles and have a gustatory trip to the two F&B destinations in the resort, Saffron Restaurant and Tomar Tapas X Bar. Not only is Amorita Resort rich in views and amenities, you can also take advantage of amazing F&B offerings that’ll make your stay in the resort envy-worthy. There’s the Weekend Buffet for steak and grill lovers, a Sunset Cocktail featuring a couple of Amorita’s signature cocktails and the daily Unlimited Wine & Tapas. Get the best rate guaranteed by booking directly on the resort’s website which entitles you to a daily buffet breakfast, welcome drinks, curated mini-bar refreshments and round-trip transfers. Most people who come to Bohol look forward to its beaches, and then there are those who would much prefer to stay close to the lush greenery of the province. These people usually end up at Loboc River Resort. A three-star river-view property, this laid-back offers a different side of Bohol some consider a mere side trip. Instead of the beach, you have the jungle surrounding you and local animals just casually roaming the grounds. The Nipa-style rooms and suites offer incredible comfort that you would forget you have the river and forest right next to you. One of the best views in the resort is from the resort’s al fresco restaurant Venia's Kitchen where you can taste all-Filipino dishes. 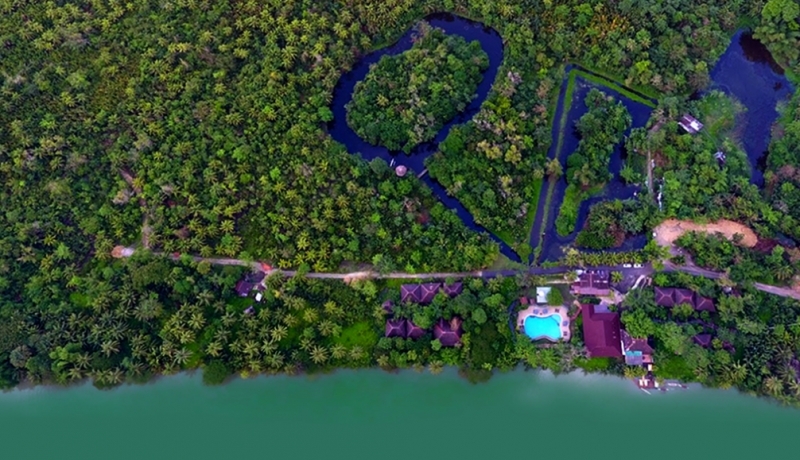 The resort’s unique location also offers off-the-beaten activities such as stand-up paddle boarding on the river, trekking, watching fireflies at night and even feeding monkeys! Affordable deals and packages at Loboc River Resort are now up for grabs! Avail the Boholiday Sale and you’ll get an accommodation with breakfast for two, complimentary welcome drinks and towel, coffee and tea-making facilities and access to the resort’s swimming pool for only ₱2,499! Want more? You can also add a Countryside Tour good for one to four people which covers visits to the Blood Compact Site, Sevilla Hanging Bridge, Man Made Forest and Chocolate Hills, to name a few. Or, avail the 1-Hour Stand-up Paddling tour inclusive of a guide, equipment and refreshments! Also located in Panglao Island, Bluewater Panglao shows a modern Filipino architecture that is truly refreshing and humbling to look at. The six-hectare resort is mostly known for the genuine hospitality of its staff who will make you feel like you’re family. The rooms are spacious regardless of category and beautifully decorated in browns and red tones. However, the highlight of the room is definitely the cantilevered beds, which means that they are made to look like they are floating in mid-air. It’s a rare, thrilling experience that you’ll really look forward to. There’s also a nightly themed dinner at the in-house restaurant Alpaya that comes with live entertainment and a wide selection of beverages at the Baroto Poolside Bar where you can drink while simply facing the resort pool.You’ll find authentic Filipino, Asian and Western therapies at Amuma Spa and a variety of adventure-filled activities including cycling, riding an ATV, an obstacle course, fishing, duckpin bowling, the list goes on and on. Other activities worth trying are gardening at the resort’s own nursery and playing board games at the Bluewater’s indoor game room. To have the best summer experience in Bluewater Panglao, book their Jump Into Summer promo which lets you stay for at most two nights in the resort with special rates for three of the rooms. It also comes with a boodle feast lunch, 15% discount on F&B orders, 20% discount on Amuma Spa services, plus more benefits. You can also get a 60-minute Amuma Hilot Lamang (Swedish) massage and a welcome Hingut-an (Head) massage, among other perks, by booking the Bohol Quick Getaway. With both outstanding views and amenities, these resorts will definitely give you a summer experience you’ll never forget. Don’t waste your chance! For more getaway ideas in the Philippines, check out TripZillaSTAYS!